Carl Frampton is set to defend his world super-bantamweight title against mandatory challenger Chris Avalos. The Belfast fighter said he wanted Scott Quigg to be his next opponent after winning the IBF crown by beating Kiko Martinez last month. However, Frampton will now meet American Avalos with next February pencilled in as a possible likely date. The fight is likely to be in England although Scotland or New York are also suggested venues. Frampton is recovering from hand injuries but he expects to be fully fit to meet Avalos in his first title defence. WBA title-holder Quigg also wants a unification showdown with Frampton although the pair face a wait. 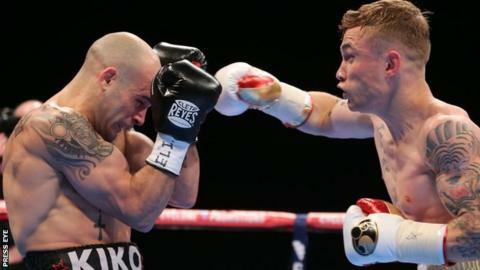 "I want to fight Scott Quigg next but I have to fight this mandatory challenger so that can't happen," said Frampton. "But after that I can fight Quigg as a voluntary defence - the Odyssey Arena would be too small, it needs to be outdoor somewhere. "You could have it in Belfast, maybe Windsor Park or Ravenhill, put 30,000 people in there in the summer time."